Arrow star Stephen Amell took a break in production on Season 6 over the weekend to swing by Salt Lake City Comic Con, where the topic of his potential Arrow and Supernatural crossover was addressed. While both shows air on The CW, there have been no formal plans announced for these unique and much different shows to cross over. During his appearance at SLCC, he was asked about this possible crossover, and what he'd like to see. Here's what he had to say when asked about what he'd like to do in the Arrow and Supernatural crossover, should it ever happen. "Without breaking the fourth wall with too much gusto, if I could show up on Supernatural as, like, someone pumping gas in their car or something like that, or just someone that they murder, that would be tremendous. And maybe it's one of those things where, I know that it doesn't make sense and I know that its one of those things where it's not the same universe, but at the same time its TV and its supposed to be fun so maybe, you know, one of these days (Arrow executive producer) Greg Berlanti will be sitting in a room with the head honcho of Supernatural and they'll just go, 'Eh, why not?'" 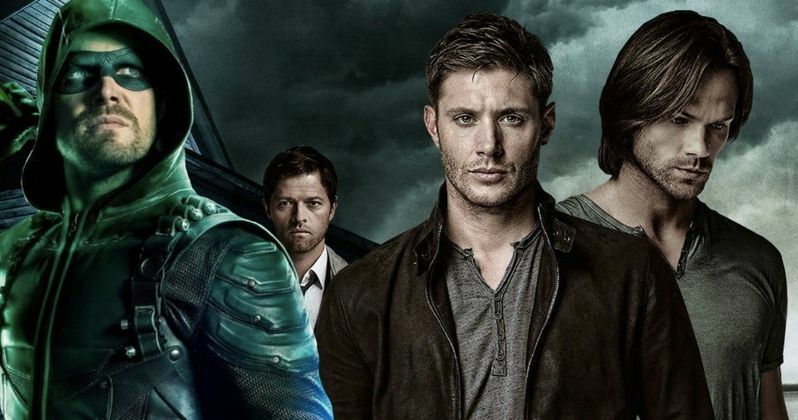 While Stephen Amell would certainly like to make this happen, it seems that his counterparts on Supernatural aren't as enthused about the idea. Supernatural stars Jared Padalecki and Jensen Ackles both appeared on a special Comic-Con episode of Conan, where host Conan O'Brien brought up the possible crossover, with Jensen Ackles calling it 'odd," while Jared Padalecki seemingly made a crack about Stephen Amell's height, stating they'd have to get some "apple boxes" for him to stand on. Still, while this crossover may not happen, Arrow will be involved in a massive crossover entitled Crisis on Earth-X, airing on November 27 and November 28. Here's what he had to say about this real crossover, when asked by a fan at Salt Lake City Comic Con (courtesy of Ammaross Danan YouTube), with the actor revealing he's already read the scripts for these episodes. "I don't know if you guys saw the announcement, but the title of the crossover this year is called Crisis on Earth-X, which is based off of a very well-known DC Comics story line Crisis on Infinity Earth. When I read the crossover this year, the only thing I'll say is... when we first did the crossover in our third season of Arrow and first season of The Flash, it was very much like, 'This is an episode of The Flash where I show up,' and 'This is an episode of Arrow where he shows up.' Even last year it was like, Flash showed up on Supergirl, but then it was an episode of Flash, an episode of Arrow and an episode of Legends. This year, it's just a four-hour movie. Technically, it goes Supergirl, Flash, Arrow, Legends, but you're not supposed to be watching the Supergirl hour going, 'This is the Supergirl hour.' It's just the first hour of the crossover. I can't spoil it, other than to say that, when I read the crossover scripts this year, I felt compelled to email the sort of original team of Greg Berlanti, Andrew Kreisberg and Marc Guggenheim, and the email just simply said, 'Guys, thank you very much for this opportunity, because it's going to be really, really cool.'" As for Season 6 of Arrow, the iconic villain Deathstroke will return, after appearing in the Season 5 finale. The new season will kick off Wednesday, October 5 at 8 PM ET on The CW, so hopefully we'll get new footage from this highly-anticipated season between now and then. In the meantime, take a look at this video of Stephen Amell's appearance at Salt Lake City Comic-Con, with his Crisis on Earth-X comments coming around the 10 minute mark, and his Supernatural crossover comments coming around the 18 minute mark.